The first of two women's AFL exhibition matches for 2015 will be played on the MCG on Sunday, as the AFL pushes for the creation of a national women's league by 2017. This year's match represents the third year women have lined up for Western Bulldogs and Melbourne football clubs, with the Demons taking out the win in their two previous encounters. 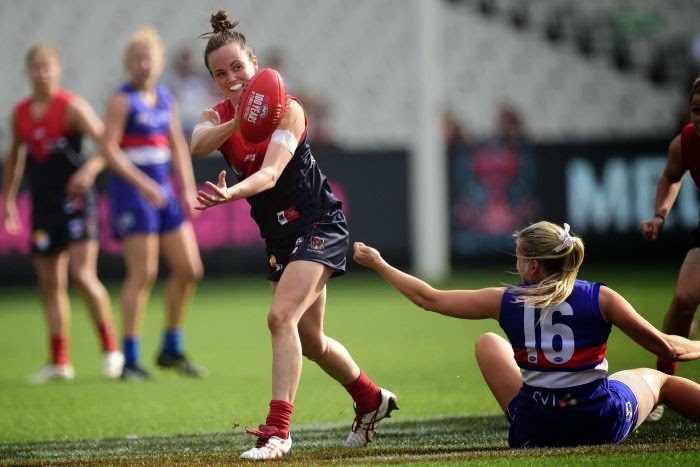 The coach of the women's Western Bulldogs team for the third year running, Michelle Cowan, said the annual clash at the MCG was part of a surge in the sport's popularity with women. "The women have played these games for the last two years, but we can just see the momentum growing, and people believing in women playing footy, which is great," she said. "It's the hallowed turf and it's fantastic to be out there, so the girls are looking forward to that to run out there and showcase what they can do." Speaking at the AFL Women's Industry Lunch earlier this month, AFL chief executive Gillon McLachlan said a national women's league was "inevitable". "It is coming. The only question is timing. There's a view that the depth of talent required will make it 2020," he said. "I'm pushing everybody to be a bit more adventurous than that ... but this is coming. "It will provide opportunities for talented girls, but more than that: for coaches, for administrators, for everyone who wants to pursue their love of this game - men or women. "But certainly there will be a lot more opportunities for women than they've had in the past." Mr McLachlan finished his address by imploring everyone in the room to "get involved, play a role and make sure that it's more like 2017 than 2020". Western Bulldogs club president Peter Gordon said women's participation in AFL was higher than it had ever been and continued to grow. "It's one of the fast-growing sports for women in the country, 19 per cent of all of the footy players in country are women," he said. "There are 195,000 female participants in Australian rules football in 2015, there are 250 new teams in the last two years." Mr Gordon said he would like to see every AFL club represented by a female side by in two years' time. "There is an aspiration for there to be a national competition for women in the AFL for the start of the 2017 season," he said. "One of the interesting theories about this, is how should it work? "I would love there to be a women's team in every one of the 18 AFL clubs that are playing now, so you could have the bulldogs playing the Saints, or the Magpies or whatever, either as a curtain raiser or as a standalone fixture. "This is an important equity issue in terms of players and women being able to play, but it's also important that young girls growing up in the game get to see role models." Last year, a spectacular mark taken by the Melbourne Demons' Tayla Harris would have been mark of the year in any national competition, Mr Gordon said. "Tayla's a young girl, she was 17 years old, drafted from Queensland ... at the quarter time address, I just told her that she needs to showcase to Australia why she's wearing a Melbourne Football Club jumper and go out there and show Australia what female footballers can do," Ms Cowan said. "A couple of minutes later she was up there in the roof of Etihad Stadium, and taking that grab, which has gone viral and had over two million hits of people viewing that mark."